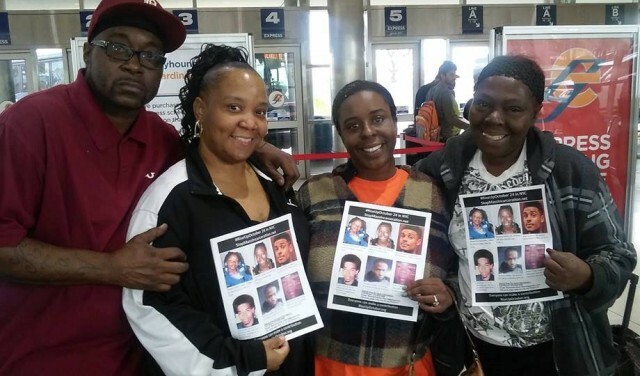 Terrance Kellom’s father Kevin Kellom, stepmother Yvette Johnson, with family members of two others killed by police, Kimberly Griffin (Kimoni Davis) and Mertilla Jones (Aiyana Jones), during national tour against police brutality. 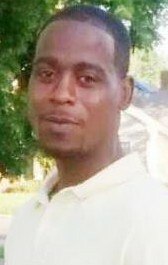 DEARBORN – The Dearborn police appear not to have been deterred by a large protest and cries of outrage over their recent killings of unarmed mentally ill Black Detroiters, Kevin Matthews on Dec. 23 and Janet Wilson, 31, on Jan. 28. 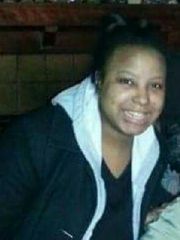 Now they and Wayne County Prosecutor Kym Worthy have targeted Yvette Johnson, the stepmother of Terrance Kellom, 19, killed in his father’s Detroit home by an inter-agency police task force last April. Worthy faced extreme pressure and criticism for not charging police in the young dad’s death. Johnson has been active along with her husband Kevin Kellom in fighting for justice for their son, rallying in Detroit and traveling to various cities to build the national movement against racist police killings. 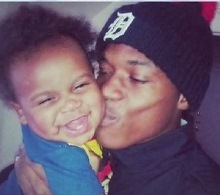 Terrance Kellom with baby son before he was executed by police task force in April, 2015. The reason for the stop is unknown. The Michigan Legal Aid Society says such searches of passengers are uncalled for. 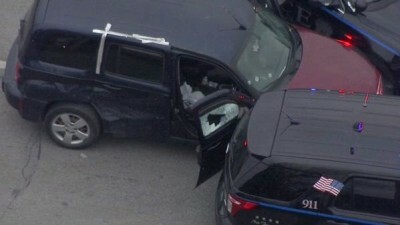 Court records in the case indicate that Dearborn police officer Cpl. Daniel J. Goebel stopped the jitney Jan. 21, 2016 at 19401 Hubbard, the address for Henry Ford Medical Center in Fairlane. Janet Wilsons car, punctured by bullet holes, after it was rammed by Dearborn cops Jan. 28, 2016. Just a week later, Dearborn police rammed Janet Wilson’s car from both sides a short distance away, at Hubbard near Southfield, then shot her to death, twice in the chest, through her windshield. They claimed she had tried to run down a cop. According to news reports, Wilson had just left a store in the Fairlane mall after suffering a schizophrenic episode and was attempting to go home. Ericka Erickson of Fox 2 News reported that Daryl Burke, a close family friend, said “She was murdered. That’s how I feel. She was murdered.” He said she was not dangerous and he had never been afraid of her. Michigan State Police ICHAT records on Yvette Johnson do not show any outstanding warrants. But at the request of Dearborn police, Wayne County Prosecutor Kym Worthy re-instituted several 2014 felony charges against Johnson related to possession of a painkiller that Johnson said had been dismissed with prejudice in Garden City. The Dearborn court tacked on an outstanding bench warrant related to a 2012 Dearborn parking ticket. Pros. 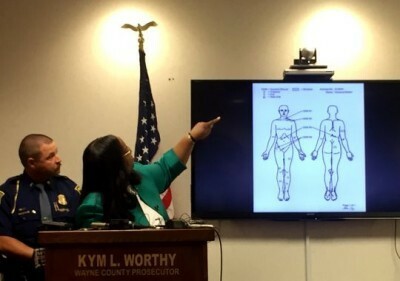 Kym Worthy with Terrance Kellom’s autopsy diagram, as she refuses to charge cops who killed him. Judge Vesta Svenson, who works weekends in a Romulus courthouse, arraigned Johnson on a “Controlled Substance” charge Jan. 24. The arraignment took place only after Kevin Kellom said he called the Dearborn Police Department repeatedly about his wife’s detention. Kellom told VOD that Dearborn Police falsely claimed there was no longer a 72-hour limit on detaining an individual without charges. The Custody Order on Johnson incorrectly dates her arrest as Jan. 24, 2016. Johnson told VOD that a Dearborn cop appeared with her on-screen, and objected to Svenson’s original declaration of a personal bond. Instead, Johnson was given a $4,000 bond, 10% cash, with a requirement for a tether. 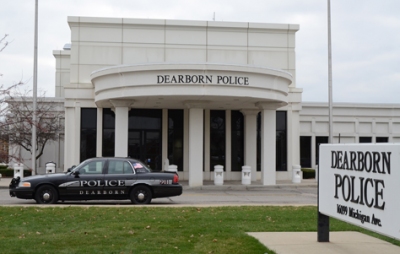 Dearborn police station where Yvette Johnson was held. The Kellom family had trouble raising $400 to bond Johnson out, but eventually with donations, bond was posted with Sheriffs at the Wayne County Jail on Fri. Jan. 29, after a lengthy wait. One of the members of the team that killed Terrance Kellom was a Wayne County Sheriff. There were further abnormal delays over the weekend, and Johnson was not released from the tether unit at Dickerson Jail until Mon. Feb. 1. In all, Johnson had been incarcerated for 12 days, part of that time in the Dearborn police station. 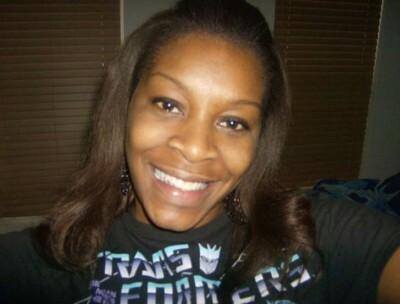 Sandra Bland, who died under suspicious circumstances in Texas jail cell. Despite the fact that Dearborn borders Detroit, which is at least 82 percent Black, and that Detroiters frequent numerous establishments in Dearborn, the Dearborn police force has no Black officers, according to attorney Craig Tank. Its police chief Ronald Haddad is Arab-American, as are some of its officers, but there is not a lot of love lost between Detroit’s Black community and Arab-American merchants in Detroit. When this reporter went to Dearborn’s 19th District Court to review Johnson’s file Feb. 1, she was escorted to Judge Sam Salamey’s chambers to do so by a court employee. 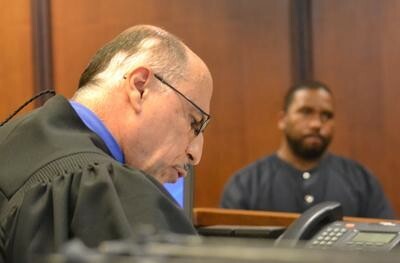 Salamey is the judge set to conduct Johnson’s probable cause and bench warrant hearings Feb. 5. While this reporter was reviewing the file, Salamey’s clerk Michelle and an Arab-American Dearborn cop, Officer Hazise, entered. Obviously enraged, Hasize snatched the file out of the reporter’s hand and physically advanced on her, threatening her with immediate arrest if she did not leave the chambers. He said she had no right to review the file because it involved felonies. However, Michigan statutes permit any citizen to review court files and obtain copies, unless limited by local ordinances, a fact that is well known in other courts this reporter has dealt with. Court administrator Eric Cyman eventually apologized for the actions of the two court employees, and gave the file back for review and copying to this reporter.